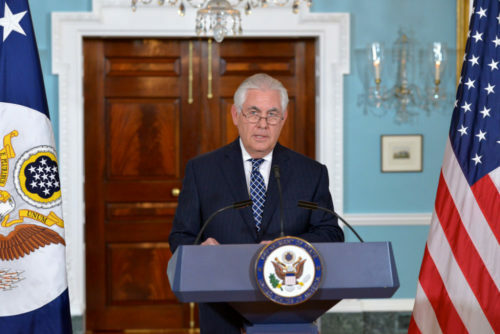 Secretary of State Rex Tillerson condemned violence against the LGBTQI community in a statement acknowledging Transgender Day of Remembrance. “On Transgender Day of Remembrance, the United States honors the memory of the many transgender individuals who have lost their lives to acts of violence,” Tillerson said. This year has been the deadliest on record in the United States for transgender people known to have been killed. There have also been increased crackdowns against the community in places like Chechnya, Turkey, and Egypt. The Trump administration has been criticized for its poor record on LGBTQ rights and issues in general, and against the trans community in particular. Not only has President Donald Trump attempted to ban transgender people from the military, his administration has also advocated for businesses to have the right to fire LGBTQ people. It also went to great lengths to make sure the rainbow pride flag wouldn’t fly on federal lands during a ceremony at the Stonewall National Monument. Transgender Day of Remembrance began nearly 20 years ago, and the Obama White House also marked the event each year.